Welcome to our secure, “Contact Us” page. Please feel free to call or write anytime, day or night. If we do not answer, we will get back to you within 24 hours. Welcome to new The Mighty Duke Power Pull website. We invite everyone to look around and leave comments or questions about The Mighty Duke Power Pull. You can use the Contact Us form to get personalized responses. We will be working to build a more complete FAQs section as we go. Hopefully, many of the questions posted here will be used in building our FAQs pages. Wagner-Martin Development LLC, (State of Washington company) the company that produces The Mighty Duke Power Pull, an automotive collision repair system is moving forward with aggressive plans for the future. 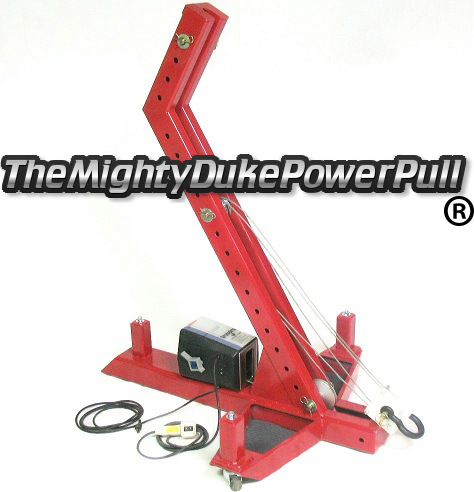 The Mighty Duke Power Pull, also known as a “frame machine” in the auto repair industry is a tool used in body shops to straighten out cars that have been damaged or wrecked in automobile accidents. In the last 5 years our YouTube video “The Mighty Duke – Portable Auto Body and Frame Machine” has garnered over 160,000 views from around the world. It is now pulling in over 4,500 views a month, and is one of the most watched in it’s field! The links from YouTube and Facebook are bringing more and more potential buyers to our new website, and a growing stream of emails and phone calls. Thank you for finding us!